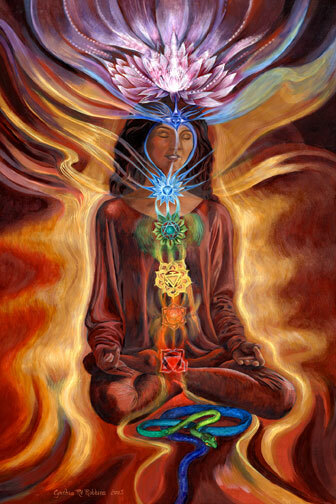 KUNDALINI - "Kundala" means 'coiled'. The Power is the Goddess (Devi) Kundalini-Shakti coiled in the Root (Muladhara) Cakra, at the root of the base of the spine. She is aroused in that Yoga which is named after her - Kundalini Yoga. You need to be a member of Kundalini Awakening to add comments! Hello there, fellow group members. Just thought i'd leave a little comment here to express my pleasure of making your aquaintance. As i brows through other comments and discussions here i notice distinct differances between your views and mine, wich originate from Sahaja Yoga. This is where i came to learn Kundalini awakening. Seeing all these different experiences and methods i'm happy to say that there's lots of stuff to bring to the table to share views, find bridges and have exciting conversations ofcours. Last comment dates from like 2 years ago, so i think a new breeze can do wonders and breath some new life in this group. This is what i miss somewhat on this site, the getting together, the communicationlevel. I mean, so many people/souls and so little direct interaction. And so far my little introduction, hope my entrance can bring new flowers. I always find the easiest way for me to wrap my head around things is to start with the earliest possible source material and work my way forward. If there is something that explains the origins of the concepts described in this group I guess that would be a fantastic starting point for me. What kind of information are you looking for? If you can be speicific, I will attempt to provide it to you. I wish there was a little more information on the subject matter listed in the information section above. I've read a bit and done minor research but still don't feel like I have a sold foundation. Thanks Michael ~ great Infos !!! I have a question ~ To billybangu ~ what Are you angry about ? The World Will Smile back at YOU :0) !! !